DCUK, The Original Duck Company, has supported Children with Cancer UK for a number of years, selling a childhood cancer awareness duck and making a donation of £4 for every sale. 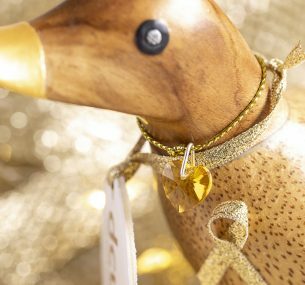 Based in the rolling hills of the South Devon countryside, DCUK are a unique gifting company who specialise in crafting feathered friends from sustainable bamboo. Hand carved and hand painted ducks, penguins, owls, flamingos and other birds are dressed in their own unique outfits inspired by different themes to make adorable ornaments. They make the perfect alternative gift and since they can be personalised with their very own name and message, they’re a real winner amongst everyone. Amongst a long list of other charities, DCUK donate from a variety of their collections to charities close to their hearts, one of them being Children with Cancer UK. 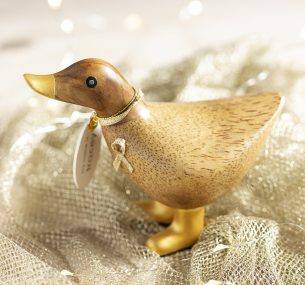 For every Limited Edition Golden Ducky bought, £4 is donated to charity. Each ducky is hand carved and hand painted and unique and special in their own way. To get your special edition ducky with a gold ribbon in support of Children with Cancer UK, click here. We hope you will help us to support this great cause! 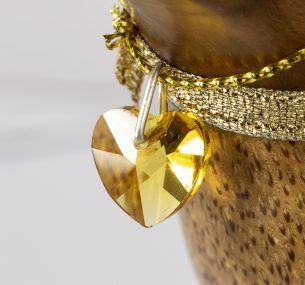 As part of the ever-growing collection and DCUK’s constant desire to help out local and national charities, they have created their very own limited edition Children’s Cancer Gold Ducky who sports his very own gold wellies and ribbon. Hand carved and hand painted, he’s a proper cutie and would make gift for anyone who would love to support the charity. As a company, DCUK is keen to help Children with Cancer UK which is carrying out valuable work in the fight against cancer, and supporting children and their families in their daily struggles with this terrible disease.